There really are only 5 things you need to do to stop emotional eating. That might sound too easy, but these 5 steps take time, patience and commitment to turn hope into belief that you can make your life better and that you can stop emotional eating. When you get to the point that you just can’t do it anymore, it’s the perfect time to change the situation. You know emotional eating is more than just calming anxiety. There’s something more that you need to live your life with peace, fulfillment and health. When you take the steps below you’ll be well on your way to become a Conscious Eater and emotional eating will be in the past. When you pay attention to your body’s needs it becomes a pathway to a better relationship with yourself. You get to know more about your real needs and experiment with how best to meet them. You get to know your limitations and the possibilities for taking care of yourself in a way you feel good about. Most of all you get to learn about what you need to take better care of yourself. I know, this sounds like a total oversimplification, but how many times do you deny yourself food? It could be that you ignore your hunger or that you don’t allow yourself to eat certain foods or both. If your body needs energy, there is just no replacing food. You can distract yourself and delay eating for only so long before hangry sets in. Your hunger signals may go quiet, for a while, but you can be sure that they will come back and you won’t be able to ignore them! Eat a balanced meal. It’s great if the craving is for a balanced meal or snack since you’re taking care of both needs at once! Choose what you eat wisely so that you’re getting both the physical nourishment your body needs and the satisfaction your mind and heart need too. Take care of your whole person. Without enjoyment there won’t be satisfaction, which can lead to emotional eating later. Sometimes you will eat purely for fuel. We all lead busy lives and sometimes food is merely a means to an end — putting more fuel in the engine so you can keep going. Food is also an important way people experience pleasure. If what you eat isn’t pleasurable on some level, most of the time, you will be left wanting, unsatisfied. At least once a day, eat for fuel as well as for the experience of pleasure. Do just one thing while eating. When you’re driving, watching t.v., working on the computer, playing a game on your phone, reading, etc. you’re unable to really be aware of what you’re eating, if you enjoy it, if you’re hungry for food, when you’ve had enough, etc. The distraction is one way of disconnecting from emotional eating and the feelings of guilt or shame about what you’re eating, how you’re eating it, how you feel about your body and yourself. Distracted eating is more of a statement about your relationship with yourself. The way to step is through self-compassion and honoring your need and desire for nourishment. Mindful eating is one tool you can use to pay attention in the moment to the taste, texture, aroma, colors, etc. of the food you’re eating. When you eat mindfully, you can make assessments about your relationship with food and how you respect your body. Calm anxiety before eating, rather than eating to calm anxiety. Easier said than done, right? This can be tricky since hunger makes anxiety worse. Anxiety can also be one of the early signs of hunger. It gets complicated very quickly! Our ancestors needed to be on the lookout for food, they might have been a little edgy about it, so when it was available they would find it and eat. Although food is abundant, when hunger is ignored this early survival mechanism kicks in and you may become a little edgy too. Help yourself to slow down. Do your best anxiety-reducing techniques, a few deep breaths, a little calming yoga, a short mindfulness meditation, 2–5 minutes or so, and then eat a balanced meal or snack. The food will wait. Anxiety or worry is one of the most frequent feelings that leads to emotional eating. Eating is something to do, it takes your mind off of the issue and depending on the food, your brain will be stimulated to release calming brain chemicals. 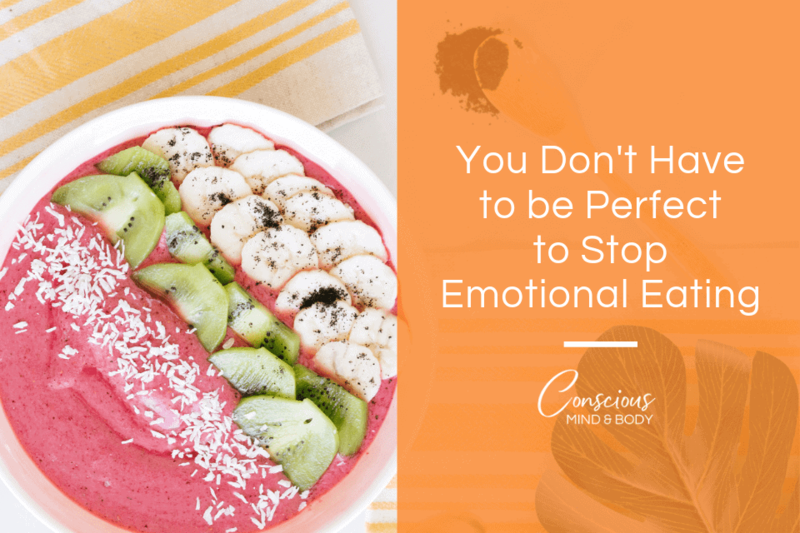 The way through this is to identify the feeling, pinpoint its cause as best you can and take one simple step toward your future free from emotional eating. Sometimes this means making an action plan and other times it means reassuring yourself and creating a peaceful environment when you’ve done all you can. Increase your awareness of the feelings you experience most often. Emotional awareness is your own personal guide for preventing emotional eating. When you know what’s going on inside, you have options for better self-care. Emotional eating is no longer a distraction from what’s really bothering you, you know and you have a choice in how you manage yourself. Food is not sinful! How many foods are called sinfully delicious? What if we accepted that our bodies enjoy pleasurable experiences like eating good food? Acceptance in the fullest sense means honoring your desire for pleasurable experiences with food, non-judgmentally. When you accept that you’re an eater who likes good food, you open up possibilities to accept times when you need to eat purely for fuel, knowing that you will eat for fuel and pleasure soon. Sometimes we do need to eat for fuel only. You have a big meeting at two o’clock and it’s important to have a balanced lunch at noon, so you’re fueled, thinking clearly and on your game. Your priority is viewing your notes and getting fuel. That’s okay some of the time. Sometimes you eat just for pleasure. Think about birthday cake or special foods you only have at holiday celebrations. These foods and the ritual of eating them symbolize the importance of the moment, your family traditions and culture. Foods have different nutritional value, not different moral value. Eat well and enjoy. Emotional eating can be the motivator for re-connecting with someone, a memory, thought, feeling, etc. If you’re craving for a specific food, ask yourself, is it the memory or person you want to connect with? Is the food a way to make it happen or would you get your needs met by calling to have a conversation, planning a visit, making dinner plans with a friend or family member? Emotional eating is the pathway to the relationship you want to experience. The problem is that the emotional eating can’t help you connect in the way you want or need to connect either with others or yourself. Increasing your awareness of emotional eating and the feelings that led you there is the way to move toward what you need. Awareness can help you re-focus from the food obsession to the relationship and you can get your needs met. These five things will get you so much further down the road to stop emotional eating than any diet ever could. You have the answers you need right inside you. My hope is that the few tools above will help you discover them! Great post. I agree 100%. I especially like tip #5. So often we are feeding an emotion with food instead of with love or attention or relaxation – i.e. more self care. It happens so often and so quickly that we don’t even notice we’re doing it. Such a good practice to always check in with yourself and identify your feelings first before you eat.